The third installment of McPhee's ongoing series, Annals of the Former World. As in the two preceding volumes, Basin and Range (1981) and In Suspect Terrain (1983), McPhee here combines biography and geology to draw a human and scientific portrait of the North American continent along the 40th parallel. It is an ambitious undertaking and McPhee handles his diverse material with aplomb, balancing such esoterica as the Miocene fill, deroofed Precambrian granite and Laramide Orageny with sensitive vignettes of life on the frontier. He assumes his readers will be as fascinated by and as familiar with geological matters as he is himself and leaves many of the scientific terms unexplained. This can present something of a problem for the general reader. The central figure here is David Love of the United States Geological Survey; at 73, supervisor of the USGS environmental branch in Laramie, Wyoming. Born and raised on an isolated ranch, Love represents for McPhee a link to the earlier settlers of this rugged and still largely untamed area as well as the grand old man of Rocky Mountain geology. 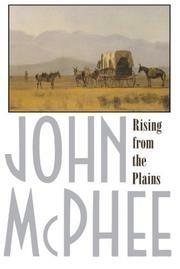 McPhee's admiration for this crusty but gentle Westerner shines throughout the narrative and adds a poignancy to the tales of their expeditions searching for the origins of the peaks and plains that surround them. A rather specialized topic, but one which is presented with style and, in the portrait of Love and his family, with affection and grace as well.